"Listen, chief, you can kill us if you want, but we can't tell you what we don't know." In retrospect, it's an idea so simple, so obvious, that it seems a wonder that it didn't occur to someone earlier: get the camera out of the studio and into the streets. But that one move transformed Italian cinema at the end of and just after World War II, and gave birth to neorealism�from the shards of war-ravaged Italy came some of the great films of the 1940s, and invigorated filmmaking worldwide with the energy and creative force that were unleashed. Luchino Visconti and Roberto Rossellini were joined at the forefront of the movement by Vittorio de Sica, whose great film Shoeshine (the immediate precursor to The Bicycle Thief, probably his finest and most famous film) now comes to DVD. Pasquale (Franco Interlenghi) and Giuseppe (Rinaldo Smordoni) are little more than Roman street urchins, barely scraping by shining the boots of American G.I.s and Italians with a few spare lire in their pockets; they live in poverty and squalor, but dream of a better life, and they plan to get there, literally, on a horse. They've hoarded their earnings and pay 50,000 lire for a steed, but before they can enjoy much time on horseback, Giuseppe's brother presses them into nefarious service. They go to sell some black market American blankets to a fortune teller, but the deal goes bad, and their prospective customer sees to it that the boys are hauled off by the authorities. 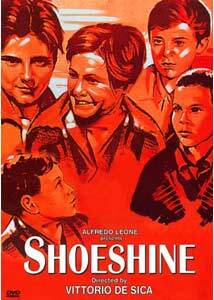 Much of Shoeshine takes place behind the walls of what's essentially a boys' penitentiary—it's a little odd to see the conventions of a prison movie played out by pre-adolescents, and in Italian, but the actors all have a guilelessness that makes it work. (On some bizarre level, it's like The Shawshank Redemption as a kids' movie—tough little tykes spewing profanity and smoking like chimneys, and looking for a safe, undetected way to escape.) The theme of the piece is an eternal one: is there, in fact, honor among thieves? Will the authorities succeed in breaking the bond that unites the boys, by getting one of them to turn state's in exchange for better treatment? Giuseppe and Pasquale are in separate cells, and they each have to learn the ropes on their own—they remain tantalized by the idea of getting out, of improving their lot, of being reunited. Some of the prison genre aspects of the story make things a little predictable, but as with so many of the other neorealist films of the period, the rewards of Shoeshine aren't all bound up in the plot. De Sica favors long takes, with a minimal amount of cutting—he gets good work from his cast, comprised principally of child actors, who don't seem at all self-conscious or overly arty. This is in many respects the first wave of vérité-style filmmaking, and De Sica's influence is evident in everything from the generations of documentarians who followed him, to the films of his countrymen like Fellini and Antonioni, to directors on the other side of the Atlantic, especially Martin Scorsese. The casual but devastating legacy of the war, the American presence in Rome, and the poverty in which so many of the Italians live, not tarted up for screen presentation, make this a fascinating document of its time and place. Many of the Italian films of the 1940s (and even today) have a syrupy sentimentality, and certainly some of that shows up here, but not enough to tarnish this lovely and genuinely moving story. Even the most cold-hearted and jaded filmgoer can't help but be touched, especially by the final, heartrending image of the movie. Image Transfer Review: Unfortunately the movie seems to have been dumped onto DVD without much care for image quality, and the picture is full of scratches and debris. Even more distracting is the presence of what seem to be the reel change indicators, huge white stars that take up the top right quadrant of the screen. It's terribly distracting, even in a film that wasn't restored in any respect for its transfer. Audio Transfer Review: Lots and lots of crackle can be heard on the soundtrack, and the dynamics are a little askew, with the volume level varying wildly from scene to scene. But unless you're working on your Italian, it's not nearly as distracting as the picture quality. Extras Review: The yellow subtitles are readily legible on the black & white image, though they are marred by a few typographical errors (e.g. "Not to bad"). The technical elements aren't as strong on this disc as one might hope, but the content goes a long way toward making up for that. A strong effort by one of the mid-century Italian masters�Ciao bello, Vittorio.